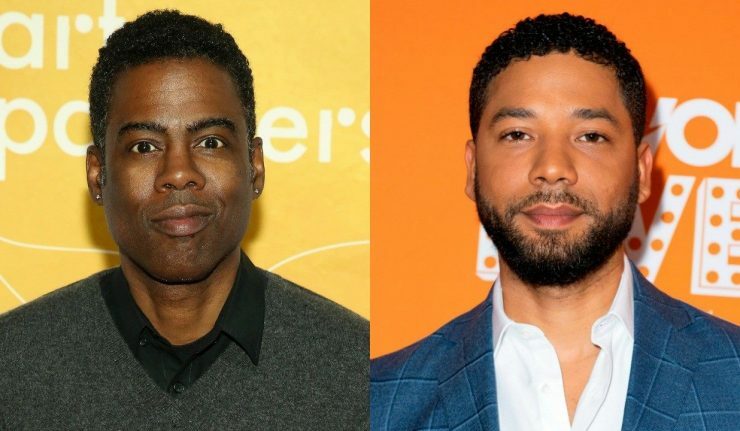 March 31st, 2019 – Chris Rock handed out the NAACP Image award for Outstanding Comedy Series last night but before the cast of blackish took the stage, the comedian roasted actor Jussie Smollett. The embattled Empire star skipped the 50th annual awards night following weeks of speculation surrounding his involvement in what Smollett initially claimed was a hate crime attack. Rock said he was warned not to do any Jussie jokes, but standing at the microphone he quickly did what comedians do. The crowd seemed ready for the timely, controversial jokes. As the camera panned to the audience, HBO star Issa Rae and Daily Show host Trevor Noah were seen laughing. Ironically, Smollett lost to Grey’s Anatomy actor Jesse Williams for Outstanding Supporting Actor in a Drama Series — that award being handed out Friday evening in an untelevised dinner, which Smollett also skipped. Speaking with Vanity Fair backstage, she said she didn’t regret publicly voicing her support onstage. The decision to speak out was in response to the digs Rock made just moments before. “I meant what I said,” she told the publication. Fellow cast member, and host of last night’s NAACP Awards, Anthony Anderson was also standing with Smollett. He told Variety he had hoped the actor would attend the event and that he was glad the charges were ultimately dropped (following an agreement to forfeit his $10,000 bail and finish community service in order to expunge the 16 charges). “I’m happy for him that the system worked for him in his favor because the system isn’t always fair, especially for people of color,” he said. Over on Twitter, reactions to the Smollett jokes were mixed. While plenty of people thought the jokes were funny, they took issue with the joke-teller. Many people used the moment to remind the Twittersphere that Rock is also the guy who laughs while two white men use the n-word — referencing the sit down Rock had with Ricky Gervais and Louis C.K. Yet Chris Rock says he has no respect for Smollett but respects white comedians who use the n-word in his presence. Y’all are aware Chris Rock is a comedian, right? I’m not understanding the shock here. The OGs believe no one or no joke is off limits. New generation get offended and stand w ppl even in the wrong.